The latest example is the hyperventilating over Romney's comments at the debate last night that when he was elected Governor of Massachusetts, he had "binders full" of women's resumes to help him build his administration. 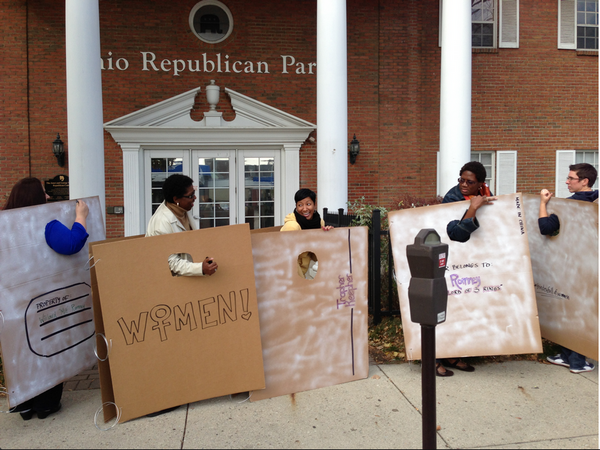 No, Romney doesn't actually want to trap women in binders. Idiots. Now, if my future President would like to put a copy of my resume in a binder to review for potential employment, that would be just fine with me. Women have become accustomed to strong words from politicians on equality and our role in the world. They are, after all, trying to win our votes. But when Mitt Romney talks about women, when he says he believes that we can do any job a man can do, I know from experience that he’s speaking from the heart. Obama and his liberal cheerleaders can continue to call Romney a monster and claim he hates women, but it's going to get increasingly difficult as more and more voters become aware of Romney's actual track record hiring women, helping people, and solving problems. But sure, keep telling women that Romney wants to lock us in binders (that doesn't even make sense!) and make tampons illegal. I'm sure that will make everyone forget the $16 trillion debt, our lousy economy, and the unending news coverage of scary dangerous stuff happening all over the world. In other words, the Obama campaign's entire strategy has now devolved into yelling, "SQUIRREL!!!" and hoping we all have the memory capacity of Dory the Fish.